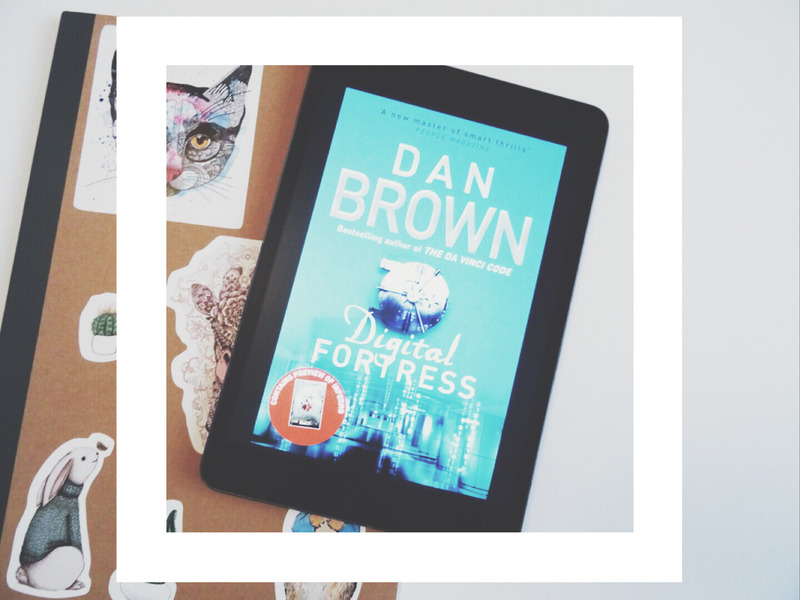 Oh hey, today I wanted to share with you how I found my most recently read book, Digital Fortress. I'm getting back into the swing of reading regularly and thought I share with you how I found it. Enjoy! Digital Fortress. Right. Can we just. Let me set the scene, I've never read a book by Dan Brown before, and wanted to start off by reading Digital Fortress. I read some reviews saying how this was perhaps not his best work, but I decided to go ahead anyway. This book follows Susan Fletcher, a cryptology genius, as she tries to solve a major problem with the National Security Agency's super computer. It's hit a code it can't break, and this is a major cause for concern. Susan and her boss, Trevor Strathmore work together to figure out how to solve this very complex problem. Susan: I really like Susan, most of the time. I love how she is the head cryptographer, like come on that's something we should all be aiming for! Girl power! She's got the beauty and the brains and knows exactly what she's doing, much to the annoyance of some of her colleagues. Susan's actions do not make me want to hit my head against the wall, for the most part, she seems to make logical decisions and, without making her sound boring, she makes quite sensible decisions. Towards the end sometimes I found myself asking why she does things in a certain way, but the pace fastens so you can understand her perhaps less thought out actions. Strathmore: Oh my god. This guy. So Trevor Strathmore has worked his way up inside the NSA, good on him, but he always seems to have a point to prove. He puts way too much at risk all for his own pride, and his actions are very poorly thought out. He seems to make rash decisions, and then struggles to deal with the consequences, so makes a poor effort to cover them up. I never really jelled with Strathmore throughout the book and found myself almost constantly annoyed at him. David Becker: David is a university professor, he is the love interest of Susan in this book, but don't expect much romance. Before the pair get a chance, David is put on a flight to Spain, to go in search of Ensei Tankado, who holds the solution to the unbreakable code. I don't dislike David, he seems like a pretty nice guy, but again, some of the choices he makes are questionable, and you find yourself thinking, if that was me, I'd say "No way, I'm completely out of my depth, I'm going home". And he doesn't. He's choices are frustrating, but you can't help but empathise with him given the situations he finds himself in. I found that it wasn't until a good quarter way through until I really got into this book. The pace is quite fast, but it does feel like the majority of all the exciting parts happen very quickly near the end. Still, it's an enjoyable build up and makes it easy to follow the storyline. There's no getting confused with who's who, which I like. I don't want to read a book and constantly have to be reminding myself who's who. I also enjoy how this book switches up the perspective. You get to know what's going on in all the main character's heads, and this will help click into place some of their possibly questionable behaviour. I found the book easy to read, I enjoyed the ending, however, I wish it could have continued, it felt like it was a bit cut short, and I was left with some questions. For the time invested in 500 pages or so I was like, "What? It can't end there, not now!". I felt like there were definitely some loose ends that hadn't been tied, but the final outcome was what kind of what I wanted, I just wanted it to be explored a little more. Yes, I would, but I'd warn you that you're definitely going to get frustrated with some of the characters, and maybe the ending. However, the story line is extremely fitting with everything that's been in the news recently about the FBI requesting backdoor access to iPhones. This book explores this concept in the age before everyone had a smartphone in their pocket, people are stressing about their emails being read by the FBI and government. Sounds familiar huh? If that was how people would have reacted back ten or so years ago, imagine just how big a conundrum we could be in now! We basically are! "Who will guard the guards? If we're the guards of society, then who will watch us and make sure that we're not dangerous?"